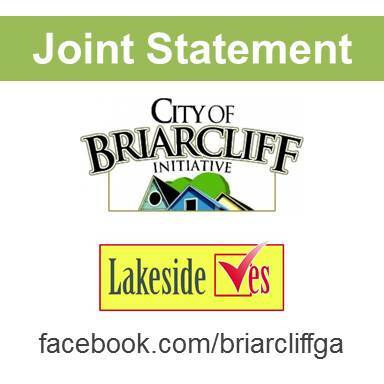 Cityhood groups City of Briarcliff Initiative and Lakeside Yes presented a joint statement at the July 2, meeting of the DeKalb County Operations Task Force at the Maloof Auditorium in Decatur. July 2nd Joint Statement Presented to DeKalb County Operations Task Force. ATLANTA - July 3, 2014 - PRLog -- Two DeKalb County cityhood groups, The City of Briarcliff Initiative, and Lakeside Yes read a joint statement before the DeKalb County Operations Task Force (OTF) on Tuesday, July 2, at the Maloof Auditorium. The Operations Task Force was created by Interim CEO Lee May and is charged with making recommendations that can be forwarded to the Georgia General Assembly by December 2014. More updates from the City of Briarcliff Initiative can be found on https://www.facebook.com/briarcliffga and http://briarcliffga.org/. The City of Briarcliff Initiative, Inc. is a non-profit corporation chartered under the laws of the state of Georgia. The group seeks to enable residents to form a new city government in central DeKalb County that would serve all people within the community and promote the health, welfare, and safety of the general public. : City of Briarcliff Initiative, Inc.